We have original science fiction by Ashok K. Banker (“The Goddess Has Many Faces”) and Bogi Takács (“Four-Point Affective Calibration”), along with SF reprints by David Brin (“The Crystal Spheres”) and Nalo Hopkinson writing with Nisi Shawl (“Jamaica Ginger”). 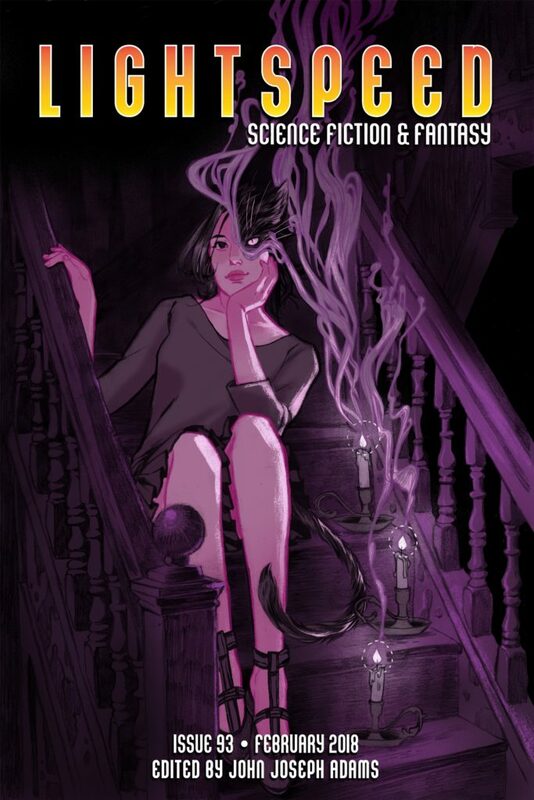 Plus, we have original fantasy by Cassandra Khaw and A. Maus (“The Quiet Like a Homecoming”) and Rahul Kanakia (“A Coward's Death”), and fantasy reprints by Jeffrey Ford (“The Seventh Expression of the Robot General”) and Malinda Lo (“One True Love”). All that, and of course we also have our usual assortment of author spotlights, along with our book and media review columns, and an interview with Carmen Maria Machado. For our ebook readers, we also have our usual ebook-exclusive novella reprint (“The Charge and the Storm,” by An Owomoyela) and an excerpt from R.A. Salvatore’s new novel, Child of a Mad God.